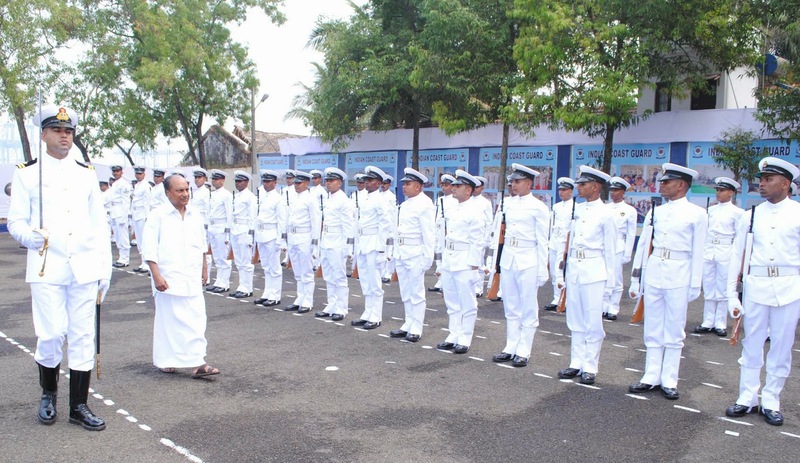 Twenty honours and awards announced for Indian Coast Guard personnel in 2013 were presented by Shri AK Antony, Defence Minister today at a well attended ceremony held at precincts of Indian Coast Guard District Headquarters No 4, at Kochi. PTM (President’s Tatrakshak Medal) for distinguished service, TM (Tatrakshak Medal) for Gallantry and TM for meritorious service were the awards presented by the Defence Minister. 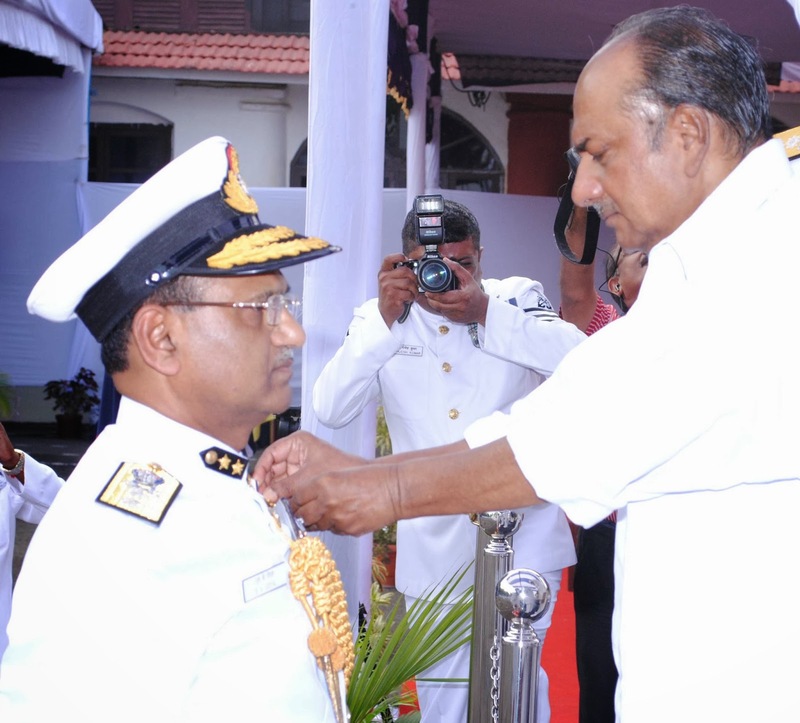 Speaking on the occasion, Shri Antony said that substantial economic activity is happening over the sea as the country develops and this calls for coordination and proactive approach from all agencies in the maritime domain. The Indian Coast Guard has a pivotal role in building up synergy of efforts between all stake holders responsible for security of our waters he said. He lauded the efforts of Indian Coast Guard in saving many lives, providing timely assistance to fishermen is distress and firefighting. IG (Inspector General) Suresh Kumar Goyal, I G K C Pande, and IG Kripa Ram Nautiyal, received the PTM. DIG (Deputy Inspector General) Donny Michael, was awarded TM Gallantry for fighting the fire on board merchant vessel Amsterdam Bridge in September 2012, as Commanding Officer of ICGS (Indian Coast Guard Ship) Samudra Prahari. One of his senior crew members Bangalan Sasi, Pradhan Sahayak Engineer also received TM for the same gallantry act. Commandant Ajay Kumar Pande, then in command of ICGS Amrit Kaur was awarded TM Gallantry for recovering a banned communication equipment in extremely difficult circumstances from a merchant vessel. Other winners of TM Gallantry were Commandant Rohit Vohra, Commandant (JG) Ashok Kumar, Deputy Commandant Muhammed Shahnawaz, Assistant Commandant Chakshendra Kumar, N Raja Kumar Pradahan Adhikari, Chandan Kumar Das Pradhan Navik and Anil Kumar Uttam Navik. All of them received the award for bravely carrying out rescue missions and saving lives. TM for Meritorious service were awarded to DIG Nanduri Venket Narasimha, DIG Rakesh Pal, Commandant Atul Kumar, Commandant Nalam Venkata Rama Rao, Commandant Alok Kumar Madhukar (Retd), Commandant Kanakadand Ramabrahmam and Bharat Singh Gusain, Pradhan Adhikari. Earlier on arrival Shri AK Antony inspected a Guard of Honour. People’s representatives from the area, Vice Admiral Anurag Thapliyal, Director General Indian Coast Guard, Vice Admiral Satish Soni, Flag Officer Commanding in Chief Southern Naval Command, Inspector General SPS Basra, Commander Coast Guard Region West, other dignitaries, personnel of Indian Coast Guard and families witnessed the Investiture ceremony.